Not because I’m so virtuous, because the truth is, I’d sell my soul to get back to my normal life. Too bad nobody’s buying. Today I played the cancer card. And I’m not sorry. I haven’t had any respiratory problems–that may be the only thing I haven’t had problems with, and my sinuses seem to be the only body part not felled by infections, yes, plural infections. I didn’t think it necessary to go for a follow-up visit. I’ve also been a little busy. I told the nurse that I’ve been a little busy. I was nice about it, despite a childish but pressing desire to blister her ears with the entire, complicated, curse-word-filled story. But I did not. That, people, is what is known as self-control. I don’t exert it all that often, so pardon my need to point it out when the planets are aligned and it does happen. I simply told the nurse that I’ve been preoccupied with breast cancer, multiple surgeries, infection, and full-time, long-term healing. Long, drawn-out pause. Cue the crickets chirping. She didn’t say anything, so I wrapped up the already-dead conversation by telling her to please pass along the message that if the doctor still needed to see me, in order to refill a benign prescription for a preventative steroid nasal spray, I would indeed drag my pathetic, battered, scarred, fused, and infused carcass to the office and wait ever-so-patiently for the all-mighty doctor to fill out a perfunctory slip of paper. The nurse said she would call me back. I said, thank you ever so much, and please, have a nice day. Guess what? The prescription is approved, filled, and awaiting pick-up. As Kenny Rogers so eloquently put it, “You gotta know when to hold ’em, know when to fold ’em.” You also gotta know when to play that cancer card. Ha! Love the idea of me channeling Gru. That made me laugh, and I needed that. Thanks, buddy. Hey, I play the MS card all the time! You have a way better reason than that – you go, girl!! 🙂 Love you! I’ve been playing euchre for thirty years or more and the standard line is: “A card played is a card laid.” You played that one perfectly, and why the hell NOT? Friends are in town and the wine is everywhere. We’re sending some sunshine your way. 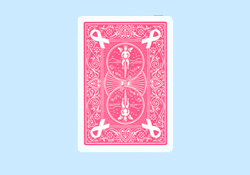 If you get dealt the cancer card, you sure as hell get to play it whenever you want. Great story.